Known for its breathtaking natural beauty, Iceland, a Nordic country with a population of only 329,100 people and an area of around 103,000 sq km, currently runs almost entirely on renewable energy, coming chiefly from its vast geothermal resources. Its unique location between the North Atlantic and the Arctic Oceans also makes this tiny European nation very windy. More often than not, traditional wind turbines tend to spin out of control, when exposed to such powerful winds. Local inventor Saethor Asgeirsson has come up with an innovative solution, in the form of IceWind CW-1000. 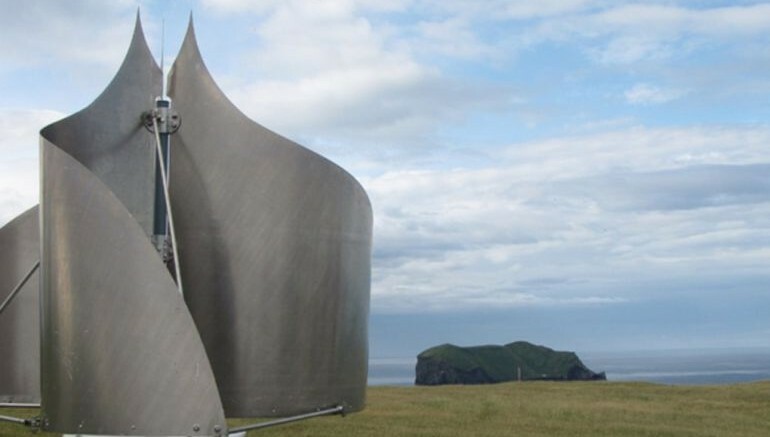 Designed to withstand the strongest of gales, this ingeniously-shaped wind turbine could help bolster the country’s renewable energy generation. Since 2013, Iceland has been harvesting wind power, which currently accounts for only a tiny percentage of the nation’s net electricity production. The more simple the system the longer it lasts. The IceWind CW-1000 is suitable for residential use, producing around 1,000 W of power at 10 m/s winds. According to the developers, the wind turbine will be available for purchase within the next few months. The company is also in the process of expanding its market to North America and other parts of Europe. What is more, it has recently signed a contract with an American investor, hoping to bring the technology to the United States as early as summer 2016. To learn more about the CW-1000 wind turbine, click here.